Well I have been missing in action for awhile here, but am back today with a pretty and simple card - my favorite kind of card! 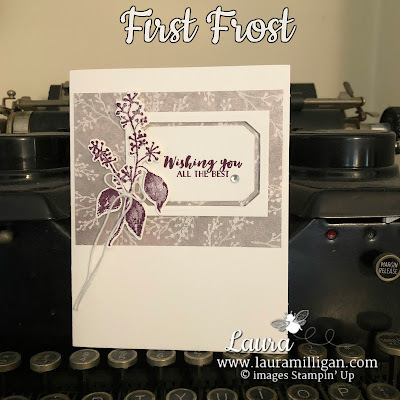 My card uses the gorgeous First Frost Bundle, found in our Holiday Catalog on pages 36 and 37. The designer paper is printed on shimmery white paper, and the designs are gorgeous!! It's so much better in person and my photo doesn't really do it justice. This card uses just a few supplies, all of which are available in my store and are listed at the end of this post. Would you like to make this card? I have created a free step by step pdf tutorial - just click HERE to download and print. Please check back tomorrow as I will be releasing my newest Class in the Mail! Supplies used on my card are shown below with clickable links to my online store.